DiskSavvy Server and DiskSavvy Enterprise provide the ability to show the amount of the used disk space and the number of files per host allowing one to gain an in-depth visibility into the disk space usage statistics across the entire enterprise. 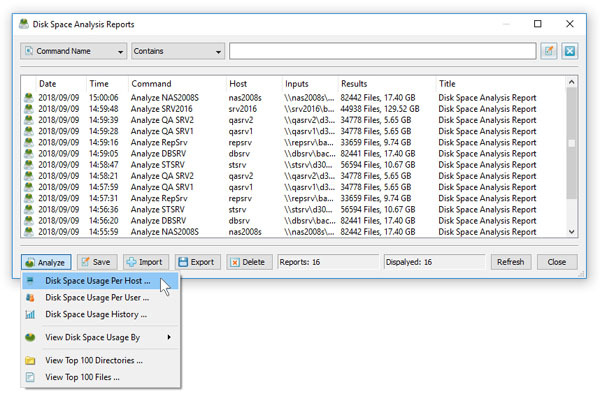 In order to perform the hosts analysis, analyze disk space usage in a number of servers or NAS storage devices, press the 'Reports' button located on the main toolbar, press the 'Analyze' button and select the 'Disk Space Usage Per Host' menu item. In order to be able perform the hosts analysis, the user needs to configure disk space analysis commands to analyze one or more servers and/or NAS storage devices through the network using UNC network names. In the simplest case, configure a single disk space analysis command, press the 'Network' button located on the main toolbar to search all servers and NAS devices on the network, select one or more servers to analyze, press the 'Batch' button and select the previously configured disk space analysis command to be executed on all selected servers and NAS storage devices. 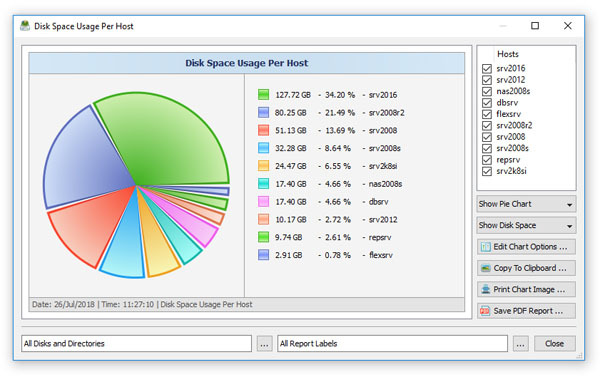 The hosts analysis dialog shows disk space usage per server according to disk space analysis reports saved in the reports database. The right-side hosts view provides the ability to select/unselect specific servers to be included in the chart. The bottom disks and directories selector allows one to select which network shares should be included in the chart. In order to copy the chart image to the clipboard, press the 'Copy To Clipboard' button located on the right side of the hosts analysis dialog.